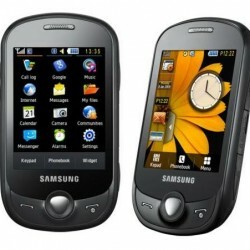 Samsung GT-C3510 Genoa, New Corby Cheaper. Samsung GT-C3510 Genoa Occurrences adds a new competitor for mobile phones online, at least from the side of a cheaper price. Samsung Genoa a.k.a Corby Pop wrapped with a cover similar to Corby Touch, dimension and texture glossy minimum access keys are not much different. Similarly, capacitive touch screen wide 2.8-inch, a tool for user interaction. Ergonomic design with rounded corners fit perceived the contours of a user's hand. But there is little difference Samsung Genoa is not equipped with a cover that can be replaceable. Cover the back also impressed fragile because it is made from thin plastic material, making the users should be more careful if you want to open it. Like Corby Touch on the front of this phone is only covered three key areas of the screen and access the call, end call, and back. To maintain security on the touch screen, Samsung Genoa using a special key panels located on the upper right side. It is located opposite the camera shutter button that flanked hotswap microSD card slot. New panel in the Samsung Genoa is 3.5 mm port jack audio, which serves as an extra hands free holes in addition to the standard port that has been provided. Thus users can enjoy music with a universal headset. On the screen Samsung Genoa is still the same with Corby Touch, namely capacitive touchscreen TFT 262,144 color screen with QVGA resolution (320 x 240) pixels. In addition to the Samsung Genoa screen is coated with glass scratch resistance. Touch screen technology as well as support TouchWiz UI menu interface provides interactive capabilities. There are three pages containing the menu structure and is equipped with home screen widgets that can be optimized according to user needs. In the navigation is also quite comfortable at the time used to move only with your fingers. Network: Quadband GSM / EDGE / GPRS. Dimensions: 10.39 x 5.54 x 1.29 cm. Screen: Capacitive touchscreen TFT, 262,144 colors, 320 x 240 pixels (QVGA), 2.8 inches, TouchWiz UI Lite. Camera: 1.3 Mega Pixels, 1280 x 960 pixels. Pros: Touch Screen, Ergonomic Design, TouchWiz UI, Multiple Instant Messaging, Social Networking Widget, FM Radio Recording. Disadvantages: No 3G, camera performance is still the standard, is still the standard sales package, Social Networking Service not maximal. makasih infonya ya, rinciannya lengkap.